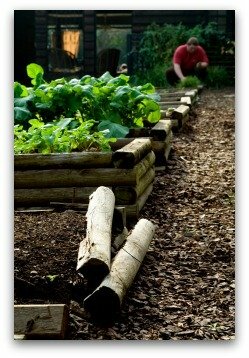 Are you interested in making an above ground vegetable garden? Here are some fun and simple ideas for building a raised bed vegetable garden or cold frame for growing vegetables at home! The early spring evenings remain frosty in some areas with even patches of snow still remaining. 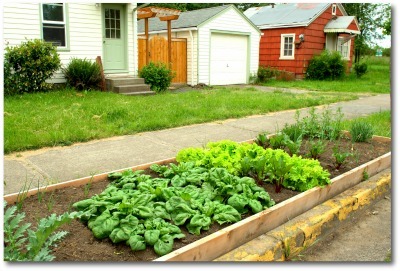 However, using a raised bed vegetable garden, your vegetables can get a head start on the growing season. By planting with cold frames or raised beds in the springtime, the plants may be ready for harvest in a matter of weeks! Many garden species need cold and dampness to germinate, because in the wild, seed would remain dormant throughout winter and sprout in spring. Traditional practice was to bury the seeds in containers left outdoors to overwinter. An easier method is to place garden seeds in a sealed plastic bag containing a bit of slightly moist soil and keep refrigerated for at least a month. Then sow in a warm place and the seeds will assume spring has arrived! A greenhouse is one possibility for an above ground vegetable garden to get a jump start on planting before the earth has warmed enough for most plants. On the other hand, a raised bed or cold frame provides many of the same benefits as a greenhouse, only on a smaller, more convenient scale. This type of vegetable garden is easy to build. It is basically a bottomless box with an optional removable top made of glass, fiberglass, or plastic to let the sun shine through to warm the soil early in the season. The box can be made from rot-resistant wood such as cedar or redwood, concrete blocks, brick, or landscape blocks. Typically, raised beds are a foot tall. You can make them 4 feet wide, and any length you want. It is a good idea to make them small enough that you can reach anywhere inside the frame easily. 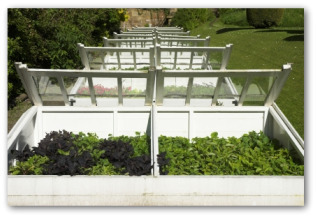 Ready made cold frames are also available made of lightweight plastic or aluminum alloy sides. In early spring, begin sowing vegetable seeds in the above ground garden or cold frame. To keep the cold frames warm on chilly nights, cover with plastic or burlap. 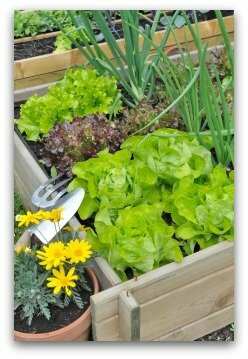 • Ideal vegetables for raised bed planting include: lettuce, radishes, and carrots. Herbs such as salad burnet and chives are also good choices. • Purchase seedlings from the garden center or start your own seeds indoors in flats. Root crops such as radishes and carrots can be sown directly in the cold frame. 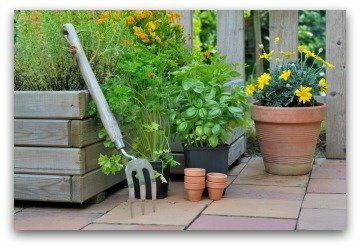 • On warm, sunny days, ventilate the planting box by propping open the top. Proper air circulation reduces the chance of plant diseases. • Water seedlings gently, early in the day. If the air is warm enough, prop the top open afterward to prevent humidity from building up. 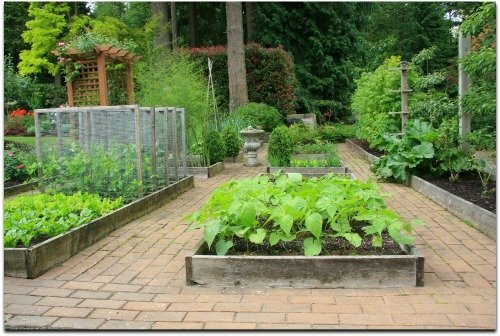 • A good balance of ventilation and watering is key with a successful vegetable garden. • Generally, watering the plants twice per week is all that is necessary. • After germination, soak the soil rather than watering overhead. There are two main problems to avoid when using cold frames as an vegetable garden. First, excess humidity encourages mildew and other diseases. Second, on warm days the temperature inside the cold frame can rise considerably. The solution for both difficulties is the same remedy: periodic ventilation. If the weather permits and the plants are past the earliest stages of development, prop open the top for a little fresh air each day. Avoid ventilating young seedlings too often. They are susceptible to damage from cold drafts. On cold nights, cover the above ground vegetable garden with heavy mats of burlap or straw for insulation.